A “paradigm shift” is taking place in financial technology. 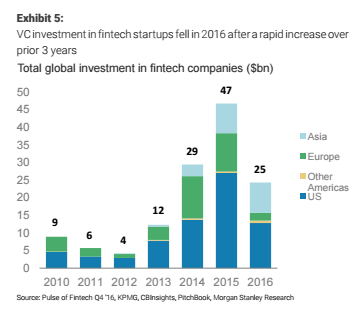 Venture capital firms, which poured $117 billion into fintech startups from 2012 to 2016, have been pulling back on their investments. Meanwhile, established financial firms are positioned to step up their spending. In a big note out to clients on May 18 titled “Fintech: A Gauntlet to Riches,” a group of equity analysts at Morgan Stanley said this shift will lead to an environment where legacy firms, or incumbents, “take the reigns”of financial innovation.